In Kongregate’s Pocket Plants, your goal is to make every world pollution-free and the only way to do this is to plant seeds, spread greenery and make them a better place to live. 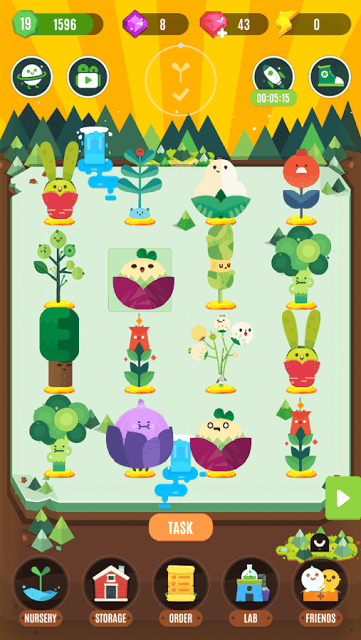 This lovely environmental-themed game allows players to combine two seeds to create new plants. Planting seeds on a barren land will “cleanse” the air and make it a better place to live. At the start of play, two plants will be unlocked for you. The ones that are locked will have a question mark. Tap “Nursery” and then tap the locked plant to get a combo hint. With the help of a hint, tap two unlocked seeds (plants) and then tap the plant button. Next, drag one plant onto another to combine them. Wait for a few seconds and then use energy to get a new plant. While the game’s hint system does provide a way to know what seeds are required to get a new plant beforehand, you may still have to keep experimenting by combining different plants to get the desired results. There’s no guarantee to get the required plant despite what the hint says so. Many times, tapping the question mark icon will show more than one combination hint. Your goal is to plant two different seeds to get a new one. Once you have discovered four plants, combine the newest discovery with other plants. You might get a new plant if you merge the newest plant with other plants. Keep doing this to discover new plants. Integrating the game with a Fitbit device is probably one of the most innovative ways to get rewards. You can get bonus energy and other rewards by exchanging them with the number of steps tracked by your device. So keep walking, jogging or running to get those steps tracked and trade them for bigger rewards. On your home screen, tap the green show icon at the top-left corner of the screen if you want to connect this game with a Fitbit device. For example: You can get 100 amethysts by exchanging ten thousand steps or x10.51K energy by exchanging only 250 steps. Save your steps for better rewards. Don’t forget to increase the max steps storage cap so that you can store more steps and exchange them with better rewards. Want uncommon plants? Why not get some amethysts to discover them? They can help you get higher level plants for your nursery. You can get amethysts by finishing orders. Just like other freemium mobile games, Pocket Plants also provides a “free” way to get gems. Instead of spending real money to buy them, you can watch 30-second videos to get gems. The game lets you watch around ten videos every day. Each video offers 2 gems. So you can easily get around 20 gems a day. Besides gems, you may also get power-ups by watching videos. You will get two power-ups every three days. Completing achievements/tasks is also another way to get gems. Tap the trophy icon to get a list of tasks and achievements. You will have to complete simple missions such as merging X number of plants. Discovering a set of new plants and completing a set of orders. Orders are somewhat like achievements. You complete simple tasks and get rewards in return. They are easy to complete and offer useful goodies. Tap the “orders” menu to get a list of orders and try to complete them quickly to get rewards like amethysts, gems and flasks. With power-ups, you get cool bonuses that will help you in your attempt at making the world pollution-free. The gems that you receive from watching videos should only be used to purchase power-ups from the lab. The game lets you make friends with like-minded environmentalists who will lend a hand to complete tasks. You can also visit them and complete their orders. Social networking in Pocket Plants can help both you and your friends get plenty of rewards by completing each other’s orders.